“Think before you act” are the words schoolgirl Trinity Sheridan wrote above her drawing of a young girl crying, against a background of insults such as “Fat!”, “Weird”, “Ugly” and “Stupid”. 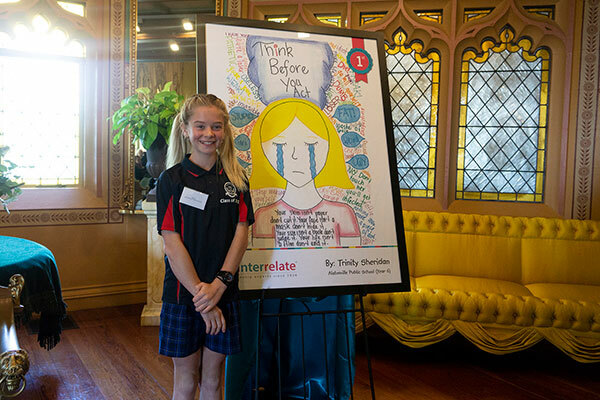 The artwork won the 11-year-old Alstonvile schoolgirl first prize in a national ‘Say No to Bullying’ poster competition run by relationship education provider Interrelate, and a trip to Government House in Sydney where NSW Governor David Hurley awarded the prize. The competition began in NSW five years ago and is now in its second year as a national event, attracting 45,000 primary school children to register this year. Patricia Occelli, CEO of Interrelate, said these figures show that victims of bullying are not alone but that there is an army of other young people willing to stand beside them. 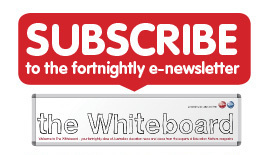 “We see far too often in the media the devastating news of young people who have felt that suicide was the only option they had left after relentless bullying. The 2018 competition ‘Bullieve in yourself’ focused on self-belief, a theme shared with the 20th Century Fox movie Ferdinand. In total, 33 finalists were recognised at the Government House award ceremony. At the ceremony, Trinity told AAP that she had been picked on and it hurt her a lot. Her artwork adds more advice than its main exhortation of thinking before acting. “Your skin isn’t paper don’t cut it,” it reads.